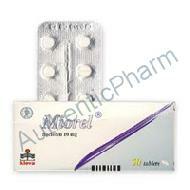 Miorel ( Baclofen ) is a muscle relaxant and an antispastic agent. It is an oral medication that relaxes skeletal muscles, the muscles that move the skeleton (also called striated muscle) and is used to help relax certain muscles in your body. It relieves the spasms, cramping, and tightness of muscles caused by medical problems such as multiple sclerosis or certain injuries to the spine. Miorel also relieves pain and improves muscle movement. It also may relieve muscle rigidity caused by diseases such as cerebral palsy, stroke, and brain lesions. Miorel does not cure these problems, but it may allow other treatment, such as physical therapy, to be more helpful in improving your condition. Baclofen works by restoring the normal balance and reducing muscle hyperactivity. In this way, it allows for more normal muscle movements. It acts on the central nervous system (CNS) to produce its muscle relaxant effects. Its actions on the CNS may also cause some of the medicine\'s side effects. Normally muscles receive electrical signals via nerves to contract and relax. Spasticity is caused by an imbalance of electrical signals coming from the spinal cord through the nerves to the muscle. This imbalance causes the muscle to become hyperactive, resulting in involuntary spasms. Baclofen works by restoring the normal balance and reducing muscle hyperactivity. In this way, it allows for more normal muscle movements. Baclofen affects the spinal cord, which is the main connection between the brain and the rest of the body. The spinal cord plays a role as a reflex system that functions as a feedback loop. Our most obvious reflex is the withdrawal of our appendages from extreme heat. Baclofen works on this reflex circuit\'s Renshaw cells. These cells are very sensitive to a neurotransmitter produced by the nervous system, GABA (gamma-amino-butyric-acid), which slows this reflex circuit down. Baclofen mimics the effects of GABA. The dose of intrathecal Baclofen necessary to slow down the reflex circuit is variable but is generally one thousand times (three orders of magnitude) smaller than the oral dose. Miorel is usually taken three times a day at evenly spaced intervals. It may take up to two months before you feel the full effects of Baclofen . The effect of the drug peaks 1 to 2 hours after each dose and is gone within 3 to 6 hours, so it\'s best to schedule doses for shortly before the daily activities when relief of spasticity is most important.